Neurobion is a supplement which acts as a multivitamin, providing a number of nutrients in order to make up for deficiencies in a person’s diet. It is important to work with your doctor before taking Neurobion Forte to make sure what dosage would be the most appropriate for your needs to avoid possible side effects. Neurobion Forte is a water soluble vitamin drug that focuses on providing B spectrum vitamins. It is necessary to keep these vitamins well balanced in the body to encourage a healthy metabolism, with B vitamins helping to regulate carbohydrate, protein and lipidic metabolisms. They also help to encourage a healthy gastrointestinal tract, central nervous system, cardiovascular system and regenerate nerve cells as well as maintain these systems after the initial application of the tablets. Vitamin B1 is used by the body to convert amino acids, carbohydrates and fatty acids into energy. It is also used to strengthen the heart, improve your mood and promote healthy nerves. Vitamin B6 helps the body make proteins, red blood cells, and manufacture neurotransmitters like serotonin that can release stored energy. An adequate amount of this vitamin will also help to prevent insomnia, lessen PMS symptoms, treat carpal tunnel syndrome, cardiovascular disease and depression. Vitamin B12 is used in the production of red blood cells and cell replication. Getting an adequate amount of this vitamin will help to prevent tingling, nerve pain and numbness as well as lowering your risk of heart disease, depression and anemia. Neurobion Forte is designed to be taken via mouth and can be consumed before or after eating as desired. Doses are often determined individually to address specific health conditions or chronic diseases that a patient may have or be at risk for developing. Each tablet should be consumed with plenty of water to help get the vitamins into your system in an adequate amount of time. Consume your dose with a full glass of water every time you take Neruobion Forte. Consume a meal before or after taking Neruobion Forte. However, you should not take this medication on an empty stomach or fail to keep up with a regular diet while you are using this product. Take the time to chew each tablet thoroughly and rinse out the mouth with water, swallowing a full glass of water during this process, to make sure that you have consumed all of the medication. 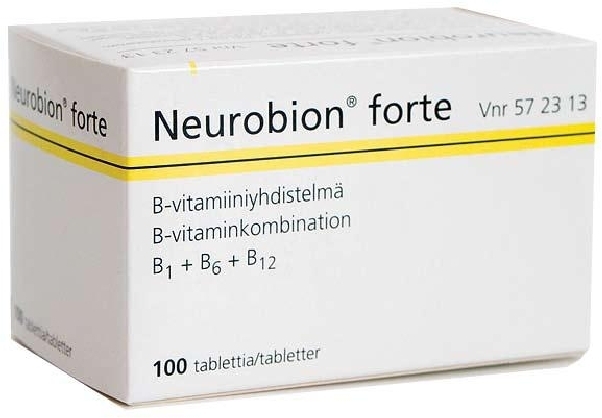 Most adults are recommended to consume 1-2 tablets of Neurobion Forte per day. Talk with your doctor about what size dose is the most appropriate for you and when these should be taken each day to ensure proper applications of these vitamins. A larger dose than what your doctor has prescribed of Neurobion Forte should not be taken. If your health has not appeared to improve after a week of taking Neurobion Forte you should lower or stop your dosage. Most treatment plans are not intended to extend longer than four weeks. Your doctor will determine if it is appropriate to continue treatment beyond this time frame. In order to ensure optimum shelf life you should keep this medication in a dry place. Do not store this medication in temperatures that are higher than 25 degrees C.
The vitamins found in Neurobion Forte may cause side effects if taken in large amounts. It may be necessary to stop using this product to prevent a potentially dangerous reaction if you begin to exhibit any of these side effects. Common side effects of Neurobion Forte include headache, upset stomach, vomiting, nausea and an unpleasant taste in the mouth. These side effects are only known to affect a small number of people that use this product. Severe reactions to Neruobion Forte are somewhat rare and are not known to affect a large number of users. Side effects that indicate a severe reaction to this product include hives, difficulty breathing, rash, swelling of the mouth, tongue or lips and tightening of the chest. This indicates an allergic reaction to the product that should be addressed as quickly as possible. You should not use more than one multivitamin at a time as this can increase your risk of overdose that may lead to poisoning or death. Overdoses of vitamins D, E, A or K are known to be particularly dangerous and will require medical attention as quickly as possible. Neruobion Forte is not designed to be taken with dairy products with a high calcium content can limit the body’s ability to absorb these vitamins as necessary. Can You Fail a Drug Test Because of Second Hand Smoke?